Comic book conventions have been happening for years but the massive comic book convention named comic con brings people together from around the world to explore their love of comic book culture. Comic book culture is expanding rapidly and the comic con convention has grown to be hosted in a number of cities world wide. At conventions, fans are able to mingle with comic book creators, stars of comic book movies and other comic book style experiences. One of the top grossing industries in the past decades, comic book culture seems to be taking the world by storm. The first conventions were usually very small events until the rise in popularity and they have evolved into massive business with different types of medias all participating in a common venue. A comic book fan can witness discussion panels with their favourite movie and tv stars or directors as well as writers and illustrators. Similar to a trade show event, there are booths with all kinds of media and merchandising for the massive intergenerational population. Art installations, neat architecture and real life characters are all part of the Comic con experience. Comic con is an outlet for fans of all genres including comics, science fiction, movies and tv. 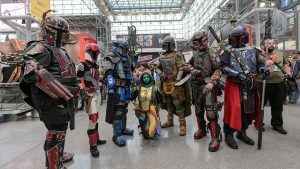 There is something for everyone at comic con and the conference has created an event that successfully appeals to all ages. What’s the Difference between DC vs MARVEL?